ECS has quietly added a new small x86 desktop computer into its lineup. 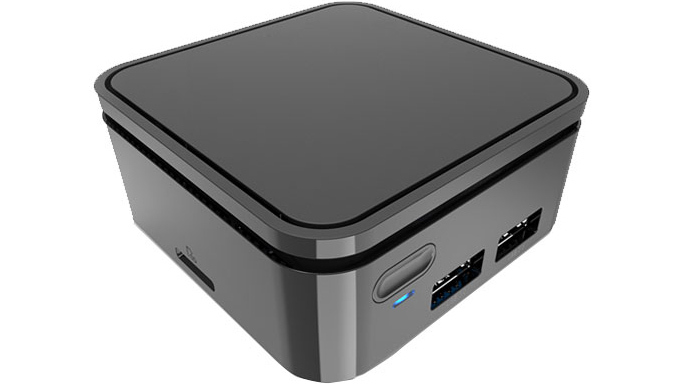 The ECS PB01CF ultra-compact PC is powered by Intel’s Apollo Lake platform and uses an enclosure the size smaller than most wallets. The computer is clearly not a powerhouse, but it supports all the multimedia capabilities that Intel’s latest low-power chips have to offer. The ECS PB01CF is based on Intel’s Celeron N3350 processor, a mobile SoC with two Goldmont cores clocked at 1.1-2.4 GHz, 2 MB cache and Intel’s HD Graphics 500 (Gen9) iGPU with 12 EUs. The SoC supports Intel's new multimedia playback engine that supports hardware-accelerated playback of 4K video from HEVC and VP9-based sources. The system comes equipped with 2 GB of LPDDR4 memory, 32 GB eMMC storage (not a lot, if you want to store UHD videos locally without using an external hard drive, but enough for streaming) and runs Windows 10 Home. As for connectivity, everything looks fairly standard here: a 802.11ac Wi-Fi module, a GbE controller, a microSD card reader, two USB Type-A headers, and one 4Kp30-capable HDMI output to connect to displays or TVs (note that the system does not have any analog connectors for monitors or audio). The PB01CF measures 7×7×3.1 cm and is powered by an external 24 W adapter. From a performance and connectivity point of view, the ECS PB01CF is somewhat behind the company’s LIVA Z computers, which are positioned as universal systems for office and media-centric applications. By contrast, the PB01CF is considerably smaller while offering 4K hardware-accelerate video playback, which makes it a viable solution for content streaming or digital signage. In fact, the latter is one the primary applications that ECS positions the PB01CF for, apart from being a cheap office PC attached to the backside of the display, of course. 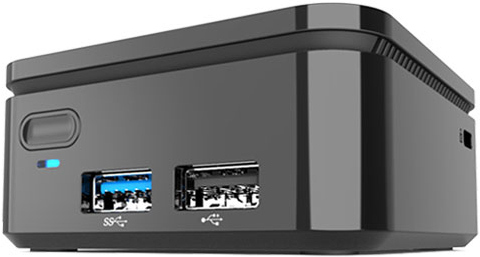 Meanwhile, when compared to Compute Stick systems, the PB01CF has more USB ports, a card reader, GbE and active cooling. ECS has not publicly announced pricing of the PB01CF and large retailers as well as price search engines do not list the product in their databases. Moreover, at press time ECS’ web site did not host any manuals or BIOS updates for the PB01CF, which may indicate that the manufacturer has not launched the device yet. Given the fact that the PB01CF does not seem to be designed for general public, it is possible that the PC is only going to be available via special channels with ECS as an OEM - a common avenue for ECS' business.